Soccer fever gripped the U.S. at the same time as the smoke from Canadian wildfires gripped the skies over Vancouver, British Columbia. This was the site of the 2015 FIFA Women's World Cup Finals on July 05, 2015. The smoke that blanketed the stadium where the match was held was most likely from three wildfires in the Boulder Creek Wildfire complex that broke out in June near Pemberton, northeast of Vancouver, and exploded in growth over the last 24 hours. The Elaho Valley fire, which has been burning 67 kilometres northwest of Pemberton, was measured at 2,000 hectares in size more than 24 hours ago. It is now believed to have grown to 20,000 hectares (almost 50,000 acres or 31.25 square miles). The situation is much the same for the Boulder Creek fire, approximately 23 kilometres northwest of Pemberton. It was just 500 hectares yesterday, but is now as large as 12,000 hectares (18.75 square miles). The third fire, the Nahatlatch wildfire, west of Pemberton, also continues to grow. It was estimated at 360 hectares yesterday morning, is now approximately 5,000 hectares (7.81 square miles). Officials believe all three were started by lightning strikes. The pall of smoke hanging over the stadium did not deter the exciting play or high spirits of the U.S. women's soccer team who decisively won the World Cup yesterday evening. The smoke caused an orange glow to hover over the city due to smoke particulates in the air that filter out other colors leaving reds, oranges, and yellows to come through the haze. This natural-color satellite image was collected by the Moderate Resolution Imaging Spectroradiometer (MODIS) aboard the Terra satellite on July 05, 2015. NASA image courtesy Jeff Schmaltz, MODIS Rapid Response Team. Caption: NASA/Goddard, Lynn Jenner. The white dot labeled Vancouver isn't Vancouver (unless you mean Vancouver Island) - Vancouver is on the mainland. The image is straight from NASA (I didn't add the labels). I don't think the white dot means anything. 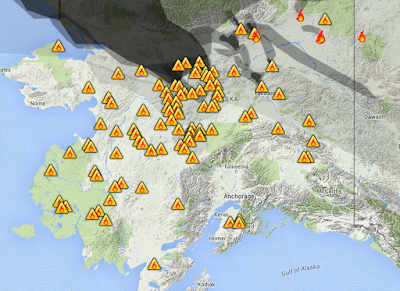 I just checked the original image and yes, the white dot is a square and it's way off base for Vancouver. Maybe they will change the name to 'Vancovered' soon? Yesterday here in Minneapolis, an area generally known for the quality of air, the MPCA declared an air quality alert with an air-quality rating at 180 on a scale of 0 - 200. You could actually smell the smoke it was so dense. Hey, shouldn't someone at wuwt be pointing out how the extra smoke is good for cooling our climate? I live in Oregon and the California drought is edging its way up into our state too. Our reservoirs are significantly low so I don't think we'll be trucking any water down to Opera any time soon. Our summer weather came really early and I'm already getting a lot of vegetables out of my small garden right now. Its going to be a longer-than-normal growing season this year. As someone living right under the BC smoke cloud, I can confirm that on Sunday the smoke did shield us from a bit of solar heating during our heatwave, lowering temperatures by a few degrees C. The downside is that the smoke was so bad we had to keep the windows closed all night and that meant for a poor sleep. Most homes in coastal BC do not have A/C. That's probably going to change over the next few years. I took this picture on the bluff overlooking downtown Fairbanks, AK at noon today. At a little over 3 million acres burned this season, we're already on track to beat the record 2004 wildlfire season with 6.6 million acres. These sorts of fires are the first discernible changes toward a new fire regime that will take centuries to achieve a new equilibrium. Many regions' natural environments will, in the decades and more ahead, be unrecogisable compared to their previous states. 3) for a time at least the increase in wildfire activity contributes to a positive feedback. But for codling and her roll-call of Denialatus numpties there's every reason to subscribe to every logical fallacy in the book. 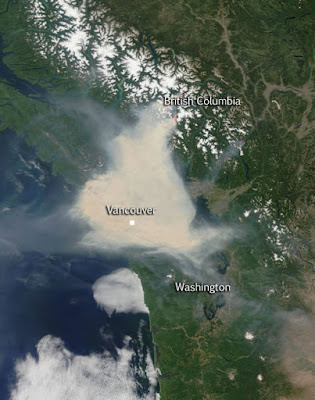 The concentration of small particulates has reached around 100 micrograms per cubic meter in Vancouver and surrounding parts of BC - the highest levels ever recorded. In contrast, the normal concentration of CO2 in the air (approaching 400 ppm) equates to around 750,000 micrograms per cubic meter. So even during Vancouver's worst recorded episode of wildfire smoke ingress, there's around 7,500 times more CO2 by weight in the air than there are smoke particulates. Next time a denier tries to use the argument that 400 ppm is too small a quantity to possibly have any effect, this might be a useful comparison to make. The concentration of smoke in the Vancouver skies is less than 1 ppm and people are being advised to stay indoors. What a difference it would make if you could smell and see CO2 in the atmosphere! Good point. I might mention that when next I see an argument from personal incredulity that CO2 is a trace gas and can't possibly have any effect. Harry, 18 months ago I posted to compare CO2 concentration in the atmosphere to that of ozone. I’ll repeat it here with the typos corrected. If all the CO2 in the atmosphere was brought to ground level at standard temperature and pressure, it would form a gaseous layer 3.04 metres (~10 feet) thick. If that same carbon dioxide was in solid phase, it would form a layer almost exactly 4 millimetres (~1/6 inch) thick. To visualise this simply, imagine the planet's surface covered in its entirety by a sheet of window glass 33% thicker than standard, and with a weight - for every single square metre of the planet - of almost exactly 6 kilograms (13.3 pounds). That is the physical reality of Tony Abbott's "weightless" and "invisible" and therefore apparently harmless gas. To compare, for the sake of context and because few people are ozone layer deniers, I also considered ozone. If all of the atmospheric ozone (that protects us so effectively by absorbing much of the incoming ultraviolet radiation that would otherwise sterilise the planet) was brought to ground level at standard temperature and pressure, it would form a gaseous layer just 3 millimetres metres thick. If that same ozone was in solid phase (and yes, ozone has a solid phase), it would form a layer almost exactly 4 micrometres (microns) thick - to visualise, such a layer spread around the surface of the planet would have 1/10 the thickness of a human hair, and weigh just 6.4 grams (~0.23 ounce) per square metre for every square metre of the planet's surface. I would like to ask Tony Abbott if he denies the profoundly important affect that ozone has on the planet, and ask him to put this in the context of the much more abundant carbon dioxide, and particularly to explain why he so cavalierly dismisses the warming effect that the latter gas has. As a coda to my previous post, that layer of solid ozone to which I referred is one third the thickness of a single sheet of cling film. The layer of ozone is one thousandth (1/1000) the thickness of the (current) layer of CO2, and yet no one dismisses the importance of ozone. So why do the Denialati and their compliant political allies try to dismiss the significance of the presence and effect of CO2? I'll be using that one, Bernard - if you don't mind. Hmmm...I didn't realise myself that there'd been so much ozone denial going on. It's not all ozone denial, it's denial that human activity caused the hole in the ozone layer - though I expect there's also denial that ozone does anything mixed in there somewhere. Denier weirdness: WUWT denies human-caused ozone depletion - again! No worries Sou. If you like I'll send you the spread sheet so that you can verify the data, their sources, and the calculations. Gawd, now it's ozone denial... It's just such a shame that trace amounts of nuttery can have such a profound effect on the radiation of Stupid through our society.